Disney's Hollywood Studios Live Entertainment - Fantasmic! LAKE BUENA VISTA, Fla. -- In a word, it's Fantasmic! Another dream comes true at Walt Disney World Resort, only this time it's Mickey Mouse's dream that comes to life in a brilliant display of lights, lasers, fireworks and water animation at Disney's Hollywood Studios. The debut of "Fantasmic!" kicks off the biggest property-wide expansion in Walt Disney World history. The 25-minute spectacular features 50 performers and combines dazzling special effects, colorful pyrotechnic explosions, beloved Disney characters, animation and dancing waters synchronized to the melodies of timeless Disney classics. The presentation lights up the sky nightly above a new 6,500-seat amphitheater behind The Twilight Zone Tower of Terror off Sunset Boulevard. The specially designed amphitheater also can accommodate 2,500 standing guests. The show takes guests inside the dreams of Mickey Mouse -- where his magic creates dancing waters, shooting comets, animated fountains, swirling stars, balls of fire and other amazing wonders. When Disney villains intrude on Mickey's fantasy and turn his dreams into nightmares, he uses the powers of good to triumph over evil. The opening scene takes place on a darkened island surrounded by a 1.9-million-gallon moat. A faint musical note pierces the air as a brilliant cone of light reveals the star of the show, Mickey Mouse. Mickey's imagination brings the waters surrounding the island to life as he conducts the "Fantasmic!" musical score. The music builds as animated comets soar across three giant water screens, sprinkling the night with twinkling stars. 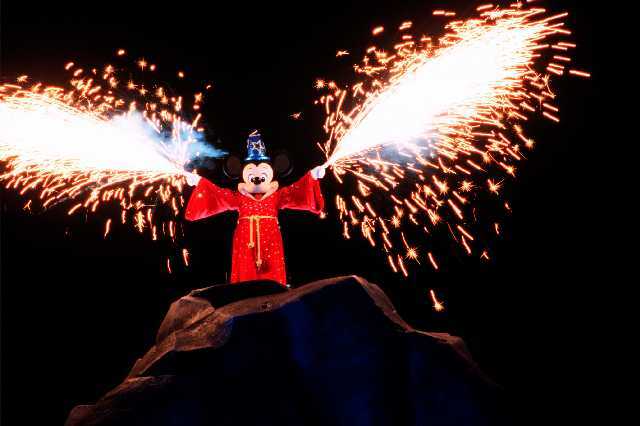 At the direction of Sorcerer Mickey, the stars dance in unison to the melody of "Sorcerer's Apprentice" while pyrotechnic comets soar across the water. To the sounds of African drums and the chatter of wild animals, vividly costumed animal characters emerge from behind the water screens. They perform a wild, upbeat version of "I Just Can't Wait to be King" from "The Lion King" while animated characters Simba and Nala splash playfully in the water. A cascade of bubbles fills the water screens as Disney characters dance to a medley of Disney favorites including "Under the Sea" and "Be Our Guest." More bubbles rise and guests discover Jiminy Cricket trapped inside a large rising bubble. Jiminy escapes the bubble only to find Monstro the whale in pursuit. Monstro's tremendous body sends waves crashing against the rocks and water onto guests seated in the front rows. With the waters again calm, the silence is broken by the thunder of a cannon. The island transforms into the "New World" as scenes and music from Disney's "Pocahontas" fill the island. The action reaches a climax when Pocahontas abruptly stops a battle and appears face-to-face with John Smith as colored leaves whirl across water screens to the tune of "Colors of the Wind." The leaves transform into puffy white clouds as the mood turns to love and romance. Disney character couples Cinderella and Prince Charming, Belle and Beast, Aladdin and Jasmine, Ariel and Eric, and Snow White and her Prince float above the water in a magical dream-like setting filled with twinkling lights and Disney love songs. The merriment fades and the music becomes haunting as the Evil Queen from "Snow White and the Seven Dwarfs" brews a magical spell to defeat Mickey Mouse amidst lightning, flares and smoke effects. She calls on villains including Ursula, Cruella, Scar, Frollo, Jafar, Maleficent and Hades to harness the positive energy Mickey possesses and make it evil. Mickey is terrified when Maleficent unexpectedly transforms into a ferocious 40-foot-tall dragon whose breath ignites the waterway with a sea of flames that overtakes the island. Mickey rises high above the water, magically creating a giant water curtain which surrounds the island. The fountains begin to dance again, smothering the fierce flames while Mickey defeats the dragon. The mood brightens in the festive finale of fireworks, sparkling effects and a full orchestral score as favorite Disney characters sail past the audience aboard the Steamboat Willie River Boat in a celebration of Mickey's triumph over evil. "Fantasmic!" premiered at Disneyland in California in 1992. The Disney's Hollywood Studios production features many new show elements and incorporates scenes from recent animated releases such as "The Lion King," "Pocahontas," "Hercules" and "Mulan." Google Search Click for Disney CDs!